When you need a cosmopolitan weekend, head for an All American city - Chicago. Brimming with culture, the nation's third largest metropolis is known for its architecture, theaters, art, and more. Take a walk in Millennium Park and admire the cityscape reflected in "The Bean"- that's the nickname for "Cloud Gate." The 110-ton stainless steel sculpture is a tourist magnet. Measuring 66-feet long by 33-feet high, the elliptical piece of art was inspired by liquid mercury and created by British artist Anish Kapoor. Between mid-spring and mid-fall, water spouts from the mouths of Chicagoans at the Crown Fountain with two 50-foot tall glass block towers. Get a bird's eye view of the park from the Nichols Bridgeway. The 625-foot pedestrian bridge links the park to the Art Institute of Chicago's Modern Wing. From September through May, catch a music or dance performance at the Harris Theater. For a map and event information, visit http://www.cityofchicago.org/city/en/depts/dca/supp_info/millennium_park.html. One block from Lake Michigan, the one million square foot Art Institute of Chicago http://www.artic.edu/ is both a museum and an art school. Each year, the museum features 30 changing exhibits. 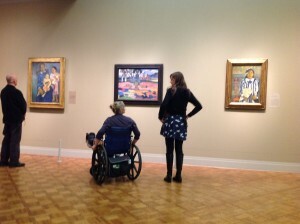 First time visitors can take a free tour of the museum lead by a volunteer docent. (American Sign Language interpreters are available, but visitors must schedule the service two weeks in advance.) Check the museum's calendar or call for times. Stop by the Information Desk for a map. Some of the not-to-be-missed pieces include: Grant Wood's American Gothic, Georges Seurat's A Sunday on La Grande Jatte, and EdwardHopper's Nighthawks. Check the museum's website for the listing of nearby garages and accessible entrances. A limited number of manual wheelchairs are available at the coat check area. The Chicago theaters are in a class of their own. Celebrating more than 50 years of improv, Second City has launched an impressive list of celebs including: Tina Fey, Bill Murray and Stephen Colbert. SteppenwolfTheatre Company productions have garnered national and international awards for four decades. For more theater in Chicago, visit http://www.theatreinchicago.com. To determine if a theater is accessible, contact the Box Office. Chicago's architecture is world-renowned. One way to admire the buildings is on a Chicago Architecture Foundation River Cruise. A trained, volunteer docent provides a fascinating 90 minute talk aboard Chicago's First Lady Cruise vessel http://www.cruisechicago.com. Gliding along the Chicago River, passengers have a view of more than 50 of the city's most architecturally significant structures such as: the Wrigley Building, the Aqua, Tribune Tower, the Willis (formerly Sears), and the Trump Tower. Boats operate seasonally and the inside the cabin seating is wheelchair-accessible. Try Chicago's famous deep dish pizza at Gino's East or Giordano's. Enjoy authentic Mexican cuisine at Mezcalina. The small, upscale establishment is a delight for the pallet and the eyes. More than 20 paintings and sculptures give the space a vibrant energy. For an extravagant evening out, make reservations at Sixteen. The restaurant on the 16th floor of the Trump International Hotel and Tower http://www.trumphotelcollection.com/chicago/. During the warmer months dine in the Terrance at Trump on Wednesday and Saturday nights when fireworks, from the Navy Pier, fill the sky. The 30 foot tall restaurant windows face the Wrigley Building's clock and the Tribune Tower's gothic crown. One of the newest hotels is Chicago is the Radisson Blu Aqua http://www.radissonblu.com/aquahotel-chicago. The upscale brand is found around the globe. The Chicago hotel is their first in the U.S. 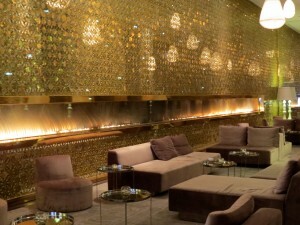 The lobby's 50 foot long fireplace positioned on a wall covered in imported brass Egyptian medallions is one of the warmest, yet cool, gathering spaces of any hotel we have ever seen. The modern design continues with the hotel's bar and restaurant--Felini. Contemporary, Italian food is prepared in the exhibition kitchen which is around the corner from an art gallery displaying the works of Chicago artists. The spacious wheelchair accessible king guest room with a roll-in shower featured his and her bathrobes, Anne Semonin bath products, an in-room coffee/tea machine, and complimentary Wi-Fi. Staying in shape while traveling is easy at the Radisson Blu's 8,000 square foot fitness center with an indoor basketball court and heated 25 foot lap pool with a pool lift. Situated steps from Millennium Park and a short walk to the Art Institute Chicago, the Radisson Blu Aqua is not only convenient, but chic. 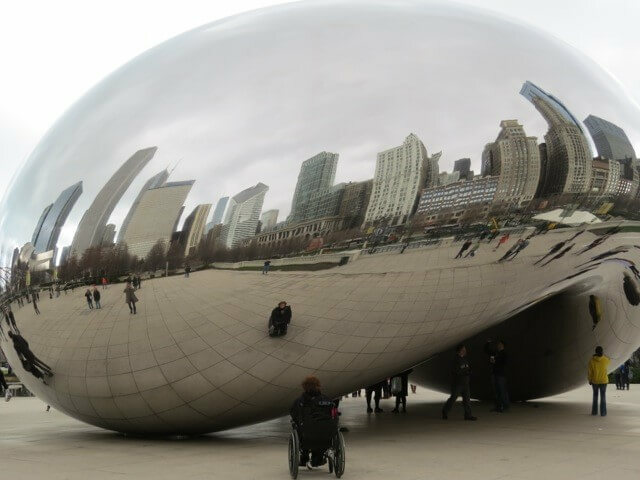 Forty-eight hours in unpretentious Chicago is all it takes to refuel the soul. 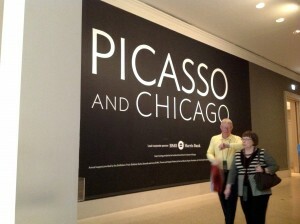 For more information on planning the perfect get away weekend, visit http://www.choosechicago.com/.